Warren: Hi, it’s Warren Huart here. Hope you’re doing marvelously well. Please, as ever, subscribe, go to producelikeapro.com, sign up for a bunch of free stuff, and of course, you can try out The Academy as well. Okay, so I went to NAMM this year, again, of course. This time, I’m talking about the Winter one, not the Summer one that I just came back from, and I stopped by Celemony, and if any of you watched the videos we did, I was kind of blown away. Well, I wasn’t kind of. I was blown away with this new poly — what do they call it? Well, I suppose they just call it polyphonic editing. Um, to be honest, it’s well beyond my brain, and I was just like, looking at it, going, what is this thing capable of? It was changing harmonics, you know, it was manipulating sounds so tremendously, it was really kind of fantastic. The guy that showed me at NAMM, I think one of the designers is a German guy, was really manipulating stuff and just creating some crazy stuff. He was taking, like, a sitar — I believe it was a sitar, an Indian instrument — and he was just pulling in tons of additional harmonics, and totally changing all of the timbre of the sound itself. So anyway, I’m not the world’s greatest Melodyne expert, and I’ve been asked by quite a few of you to sort of explain it. So I got a friend of mine called Carlo Libertini, who does a lot of other videos and stuff, who also has done some work with Celemony to make a video. 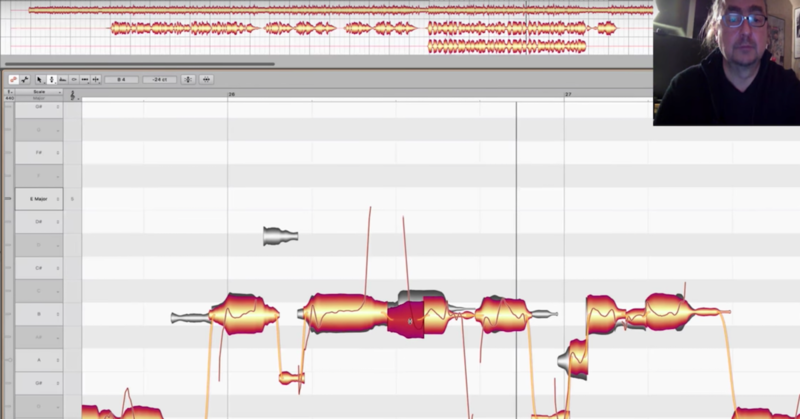 So this is a video talking about the new version of Melodyne Studio 4, and he’s going to break it down and talk about all of the polyphonic kind of manipulations and sounds you can do. So here’s the video. Please leave a bunch of questions and comments below. I will get him to answer. I’m very excited as you know. I use Melodyne to extract MIDI from my drum samples when I put drum samples in there, and I’ve always found it to be very quick and easy to use, but to take it to the next level, I thought I would go to somebody who is more of an expert on it. So take it away, Carlo! Carlo: Thank you, Warren. Hi everyone. This is Carlo Libertini. I’ve had the unique pleasure of working closely with the good folks over at Celemony — the creators of Melodyne for some time now. I love audio editing in programs like this that really open up a whole new gamut of creativity. 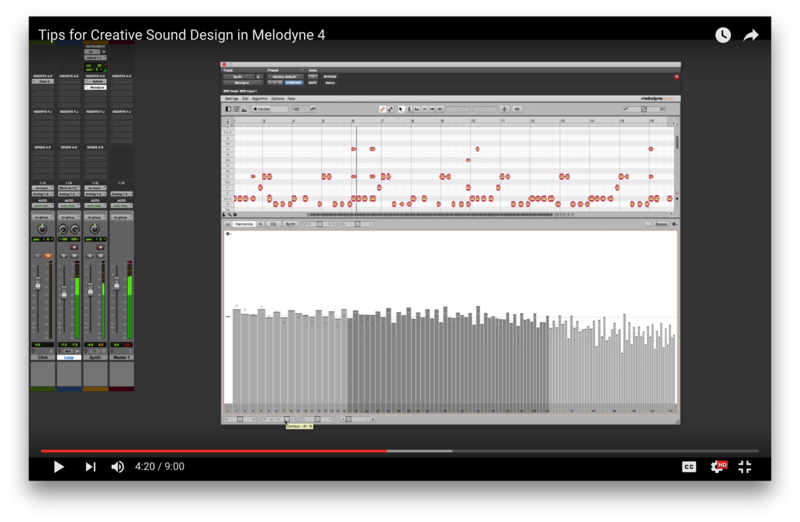 Melodyne has evolved once again, it’s on version 4, and one of the most popular features of version 4 is the new Sound Editor. Here, you can actually manipulate the harmonic overtones and the EQ. The total sound, the colorization of sound. But what’s different about this is unlike traditional filters that you would insert in your sessions, we’re using something called Polyphonic Spectral Shaping. So much like Polyphonic waveform editing that is exclusive to Melodyne, it’s using that magical Melodyne engine to also now color the tone of your sound as easy as you could adjust a pitch and timing, amplitude and formant, now you can adjust the harmonic overtones and the EQ, and much more as well, as we’ll see in a minute. So why don’t we get started here? I’ve imported some tracks, and I want to thank miss Suzie Hatten here in the Boston area. This is a song of her’s called, “Here and Now.” She’s an amazing artist. Now these tracks are rough. They’re unmixed and they’re unedited, so please, please just keep that in mind as we’re doing this demonstration here. So thank you Suzie for letting us use these. Please look her up. Great. 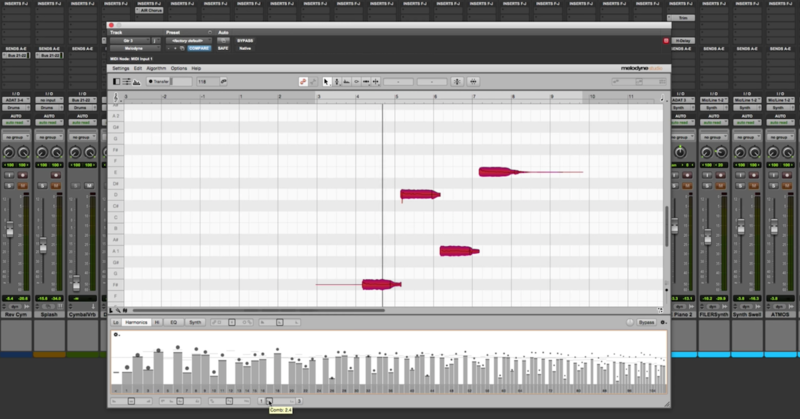 Now, what we’re looking at here are the multiple tracks here in the top pane, the editor window right here, which is traditional for Melodyne, and the new Sound Editor pane. Here, we can bring this up a little bit more so we can see it better. There. Now, what we have here is the ability to manipulate the harmonic over tones — the unique finger print of the sound, with both the harmonics and an EQ section, and a synth section. Now, there’s a lot of information online about this already, I understand. And do please visit celemony.com to get more. So what I want to do here is kind of show you how I use it in my mixes, and I’m always learning. There’s never one way definitive to do anything with Melodyne, and that’s what’s amazing about this program, is in the hands of different people, you often get very different and creative results. So let’s first take a look at the harmonics section. I have here a select focus on let’s say, the acoustic strumming guitar. Let’s start at bar 38 here and take a listen, and I’ll solo that guitar. There we have an acoustic guitar. Now, the balls that you see bouncing here on each one of the bars represents the sonic energy of that overtone. Really cool. I’m going to solo as well the second acoustic, and here is the second acoustic. Let’s hear them together. Alright. Now, there’s a lot we can begin to do here. If I wanted to add a bit of uniqueness to one of those guitars to make them outstanding, I can now do that with the Polyphonic Spectrum Shaping capabilities here in Melodyne 4, AKA, Sound Editor, and what we can do to begin is let’s say I can work with my EQ first, my synth, or my harmonics, and harmonics I’ll leave right there. Now, a lot of this here you can find information online, but we’ve got an emphasis slider, which helps emphasis the natural characteristics of a tone, dynamics makes the louder parts louder, the quieter parts quieter, brilliance down here in the bottom left, and then we have contour. Next one is odd/even, and then comb. Now, these are kind of self explanatory, and I don’t want to get too much into each one of them, but I will get into a few of them. The ones I use most often. But I first want to point out here is bar zero, this mystery bar here. What that is is also editable. Watch as I can slide it up and down, and it’s working in decibels. That uses overtone sounds that are below the fundamental, and often, I find that if you reduce this down to zero, or somewhere in between, it can actually remove some of the noise if there’s any background noise or some kind of unique noise characteristics to your sound, so again, there’s a good tip for you. The secret bar zero here on the far left of the harmonics, and you can hold your Command button and click any one of these at any time to reset them back to their original state. You can rubber band, and you can group edit them, it’s pretty easy, and again, use any one of these macro sliders here to help get started. To help you get that tone you’re looking for. But keep in mind, here in the top left is the settings, where you can reset the spectrum from here, copy it in the parameters, paste them, clear them, shuffle them, or show all harmonics. Shuffle is really cool. Every time I select shuffle, it’ll automatically shuffle the sound. Let’s take a listen to that while I — here, while we do it in real time. And again, you can reset everything. There’s a global reset here up in the top right corner for all of the settings here in the Sound Editor function, as well as a bypass function, which is really great for A/Bing your work, and a gain function here, so you can attenuate the gain so if you’re working and you hear that the gain structure has changed a little bit, you can attenuate it there with that knob next to the bypass button. Keep that in mind. Really cool. Following that, we’ve got the EQ section, and what this does is it paints a general fingerprint of what the EQ looks like — the graph. I can see where I’ve got some scooping, some boosting, and again, we’ve got the emphasis slider, which allows us to change the tonality of the character of the original sound, dynamics, and then we’ve got brilliance once again, we can boost and reduce that. Following, we have contour, which allows us to boost what’s already there, or cut it, make it a flat frequency response, or even invert it like so. So there we step into the realm of creativity and tonality. Tonality is pretty unique to spectral shaping. What it does is it will fade out notes that are foreign to the scale. Fade them in or fade them out like that. It gives a really interesting sound. Let’s take a listen to that. And again, Command+Clicking, if you’re on a Mac, will reset all of the parameters back to original. So let’s have a little bit of fun now. If I hold Command and click harmonics at the same time, I can see both panes. The harmonic one and the EQ one. So what I’m going to do here is while we’re working on these acoustic guitars, let me hold Command and solo both of those, and here, we’ve got the acoustic hold and acoustic strumming. I’m going to take the strumming, and I’m going to adjust the brilliance a bit. I want that guitar to sound a little outstanding. So if I’m really mixing now, this is how I would begin to work here. I’ll go through the step a little bit and you can watch it along the way. Take a listen. So as you can see, I raised the brilliance here on the harmonics section. I boosted the high overtones to make it more of that particular sounding. Separates it from the other guitar as well. Let’s take a listen to that in the mix. And again, it’s completely editable, and if you want to change it at any time, you could use the global reset here, or right here in the harmonics display box itself, reset spectrum. But I actually liked it, so I’m going to boost that up just a little bit more and keep it that way. Let’s have a little bit more fun. Why don’t we go to the — let’s do a little copy and pasting. This is another practice that I often do. It’s fun to try out, and it often yields better results than I imagined, but still, even when you do this, remember, a little goes a long way. Let me select guitar A here, and then select focus on it and take a listen. Okay. So here in the EQ section, we can see here is the graph that’s representing guitar A. I’m going to come to its setting box and choose copy. Now, this spectrum is copied onto my clipboard. I’m going to choose that same acoustic strumming. Select focus on it and I’m going to choose its settings box and hit paste. Now, you can see the original one is in light grey, but the new one that’s applied over it is in solid grey. Now, I’m going to bypass that, solo the acoustic, and let’s take a listen to this. And I’ll toggle it on and off, the bypass function. And it’s still completely customizable. And again, we can use these EQ tonal — let’s see, we can use these macros to adjust it. I could actually lower it a little bit, get somewhere in between with the contour. See that? And I could reduce its brilliance a little bit, or I could boost its brilliance so much, and I can even take sections of it by dragging and lowering them here, even one bar at a time. I can sweep out frequencies, I can actually boost certain frequencies, and I can select certain bands by double clicking. And again, everything here is completely resettable at any time. Now, let me open up my harmonics one more time again, and there we go. Now let’s have a little bit of creative fun here. We’ve been doing some corrective, creative type stuff, but let’s take a listen to this Leslie guitar. This is a good one to have a little fun with. Here we go. Let’s take a listen to this part. I’ll set my loop markers again somewhere between, let’s say here and 55. Let’s take a listen to it. It’s all handled for you internally. Alright, let’s take a listen to this, and I’m going to manipulate the emphasis slider, and really affect the sound. Again, now we’re in the realm of creativity here. Speaking of which, let’s activate our synth functions. Here, we’ve got three boxes. One is for spectrum shaping, formant, and amplitude. You can use this to kind of adjust the attack, decay, sustain, and release of certain applications. For example, you can draw in how the spectrum is attacked, the sustain of it, and the release. You could also do the same with the formants, and the amplitude. Now, this is really tricky. You need to really listen when you’re using this, and remember, a little goes a long way. I’m going to exaggerate this just for effect at the moment. Let’s take a listen to that guitar again with the whole new editing applied. And again, it’s all completely resettable. You don’t have to worry about ever damaging your audio, or screwing anything up, because you can literally just click it all back to normal at any time. Now, one more thing I want to show you. Here’s a neat trick — is we’re talking about making things a little outstanding earlier. Well, here’s something I like to do. Let’s go back to that guitar strum here and take a listen. Set my loop markers again. I’m just clicking and dragging in Melodyne’s timeline, by the way, and you can set cycle here in the toolbar up here at the top. Alright. Now, a little trick that a lot of people aren’t aware about. You can do formant shaping, both in the harmonics range, and in the EQ section. Watch as I move my mouse down. You see how the cursor changes right there to a different icon, and the same one here in the EQ section? I can click and drag this and literally adjust the formant, which is the unique sound characteristic. I’m not changing the pitch, but how it sounds. It’s best heard. Let’s take a listen again. Let’s hear that in the mix. So there you have it. These are some of the little tips and tricks and techniques that myself and other people in the industry are using, thanks to Melodyne here and the new Sound Editor that’s available in Melodyne 4. Of course, my best advice is to really dive in. Just remember, you can’t do anything wrong. It’s a great way to add a whole new dimension and opportunity to your mixing and editing as well if you’re already using Melodyne. So enjoy yourself, and thanks for letting me be here, and I look forward to doing more in the future. Warren, back to you! Warren: Well thanks ever so much for watching I really hope you enjoyed that. Thanks Carlo for helping us out and giving us this free information on the channel, I really appreciate it. As ever, please subscribe, go to producelikeapro.com, sign up for the email list, you can get a whole bunch of free stuff, and thank you ever so much for watching, and have a marvelous time recording and mixing! And leave loads of questions below!